Already a year has passed since Sarepta’s first drug Exondys51 was granted FDA approval on 09/19/2016. The landmark decision by Janet Woodcock, despite the review team’s opposition, gave hope to all the kids with DMD (Duchenne Muscular Dystrophy) Exondys51 is in the middle of a great launch, one of the most successful first-year launches of a rare disease. In the last 2 quarters, Sarepta exceeded its own guidance and analyst expectations twice. The company has raised revenue numbers for the year from $80 million up to $125 to $130 million. On a full year basis, we think the company will beat its own and analyst expectations again. We are projecting more than $160 million for the full year 2017. We will get a chance to take a look at the numbers in the upcoming quarterly report by end of October. On the pipeline front, there are a large number of catalysts to yet play out over the next 2 to 3 months. It’s hard to imagine the pressure that Sarepta’s employees are working under with so many events and IND submissions to the FDA looming. Sarepta will submit IND application for three new clinical trials, while two of these clinical trials supposed to commence by fall 2017, so we can expect news in the coming weeks. 3. PPMO the follow-on and more advanced clinical trial of the PMO which has been approved by the FDA will commence by year end of 2017. 5. EMA Approval in Europe first quarter of 2018 According to my calculations, the company note Q1 to Q2-2018 to be on the safe side in case the CHMP ask for oral explanation on the 180-Days clock stop. 6. Summit PhaseOUT DMD Phase 2 data in Q1 2018, SRPT has the rights in the United States according to the companies agreement. 7. The results of Dr. Mendel’s Gene Therapy, which he expects to be in the clinic by the end of October to early November, according to the article “Jerry Mendell, in PPMD Webinar, Details Plans for Possible Trial of Duchenne Gene Therapy“. The researchers expect to have a good idea of whether the treatment works by 18 weeks of it being administered, that will make March-April a very important milestone for the gene therapy, just a reminder, AVXS share price has roughly doubled from around $45 to $90 adding around $3 billion to its market cap since releasing the interim positive results from their SMA gene therapy trial conducted by Dr. Mendel as well. We have to take in a consideration the DMD market size is almost 1.5 to 2 times the SMA market, so SRPT will have a huge gene therapy market for DMD if the clinical trials show success. Now let’s move to the technical standpoint, SRPT had a nice run ahead of the Q2 earnings, from the low of $28.83 to close at $34.08 the day before the earnings released, followed with a gap up to the high of $44.24. This earnings the run started from $35.26 almost a month ago, reaching the high of $47.96 after Golodirsen X53 Phase-2 positive results, in case of another beat the expectation and update the full year outlook, I think we might see another spike in the share price. The last move forms a technical pattern called Cup & Handle. This is a continuation pattern comes after an uptrend move followed by a technical correction, until the bears becomes exhausted and so the down movement becomes slower, at that point we can see the sideways move for a short period of time. This sideways move forms the bottom of the cup, until the bulls step in and take the control from the bears, the share price start moving higher. While the handle start forming showing a pause and consolidation after the big run up, moving side way or a slight downtrend forming the handle till the next breakout of the cup line upward, to start a new uptrend with a target calculated as the depth of the cup. 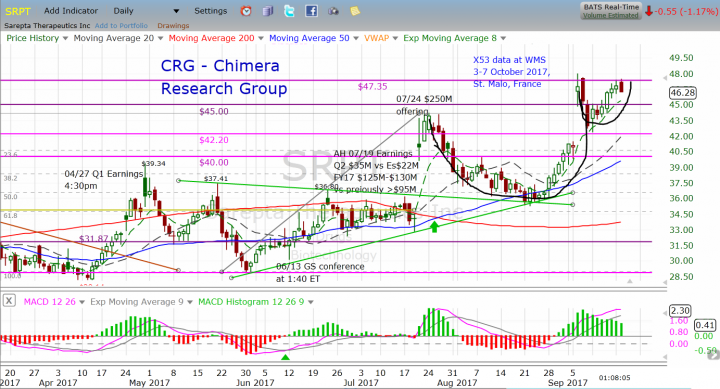 In the case of SRPT, it is a move of at least $11 from the breakout line.